It was an all-American weekend bonanza in San Francisco. The city was bursting at the seams in the most magnificent way. 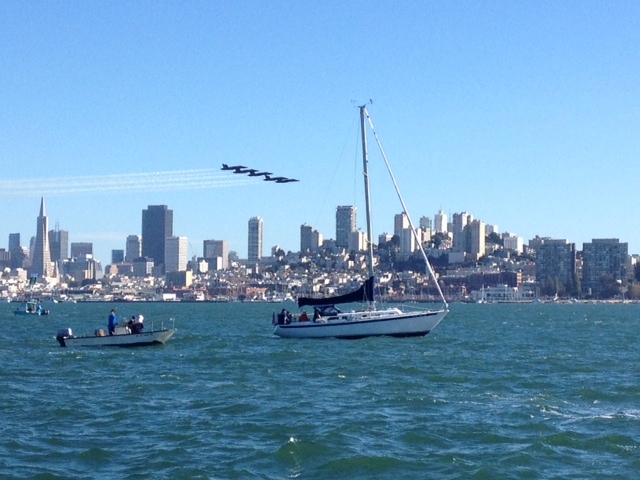 The Blue Angels roared overhead performing acts of aviary awesomeness. America’s Cup sailboats zipped across the Bay. AT&T Park swelled with orange and black. 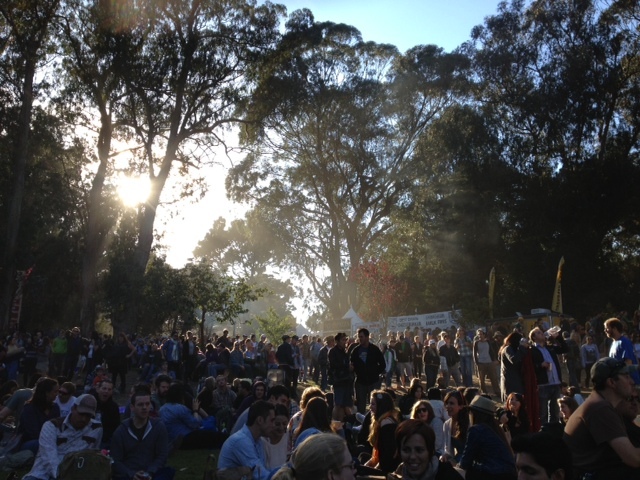 Golden Gate Park’s signature scent of eucalyptus and smoke melded with the music from Hardly Strictly Bluegrass. Airplanes, sailboats, baseball, bluegrass and sun. Oh my. San Francisco, you shined. I found myself in the thick of it – on a boat in the Bay on Saturday, at the Giants game that night, and at Bluegrass on Sunday. It felt like a Choose Your Own Adventure weekend. My very favorite kind. 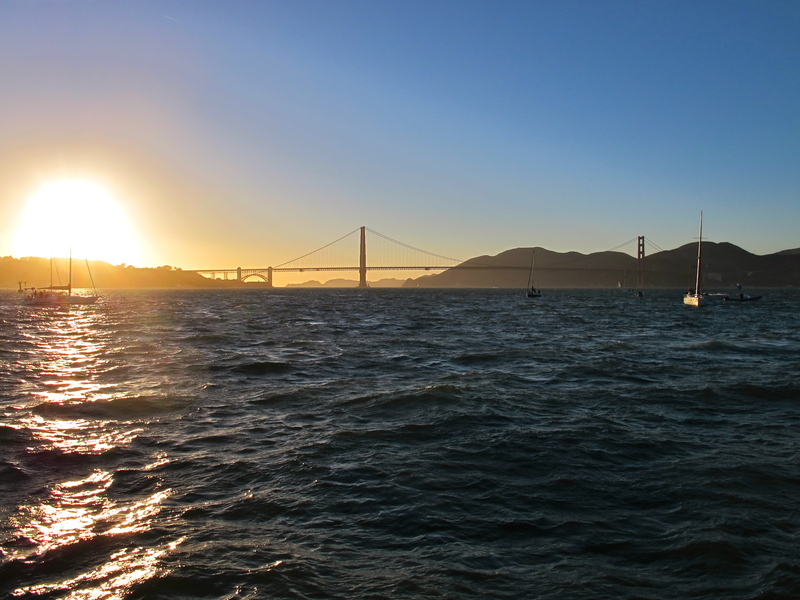 I ditched my car and ended up in a random assortment of vehicles and vessels – the Muni bus so smushed with people that I thought it would tip over on the turns, a boat from Sausalito named Cimba, a sleek seat-heated Uber, a taxi, and Elle’s bike. I rode the bike home from Bluegrass with limited success. Sticky gears + train tracks = tumble. The officer directing traffic at Church and Dolores saw me on the street with the bike sprawled next to me and yelled out, “Did you get hit? !” I scraped the bike off the street and quickly hopped back on. “Nope, I’m fine. Thanks! Just those dang Muni tracks.” I was lucky I didn’t fall again trying to wave while I pedaled away. Umm. Embarrassing. So now it’s Monday, not nearly as fun day. Fortunately, the weekend’s buzz and hum hasn’t worn off entirely just yet. I think it could likely be enhanced with a quick, pan-seared steak for dinner in keeping with this all-American theme. I first made this last week. It was simple and proud and deeply satisfying. All you need is a raw rib-eye from a happy cow, salt and pepper. And, a cast-iron pan. If you don’t own one, I highly recommend that you get one. They are the heavy-duty, naturally non-stick, indestructible pan that sears food to perfection. Need more convincing? Read this. I like my steak on the rare side of medium rare. 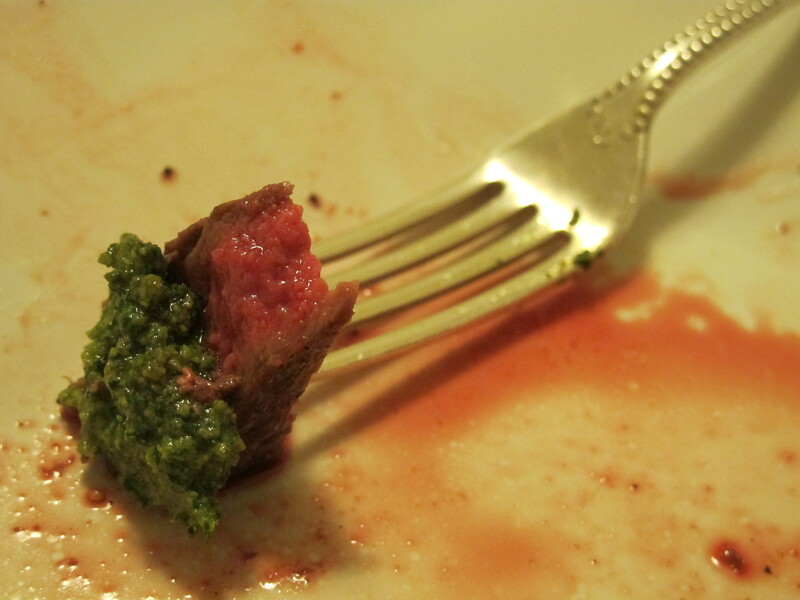 This time, I ate it with a dollop of homemade pesto on the side for a little garlic basil punch. I wish you had been there. I would have carved you off a big bite. Bring the steak to room temperature. Place a 10-to-12-inch cast-iron skillet in the oven and heat the oven to 500 degrees. When the oven reaches temperature, remove the skillet and place on the range over high heat. Coat the steak lightly with oil and sprinkle both sides with a generous dash of kosher salt (use more salt that you think you need). Grind on black pepper. 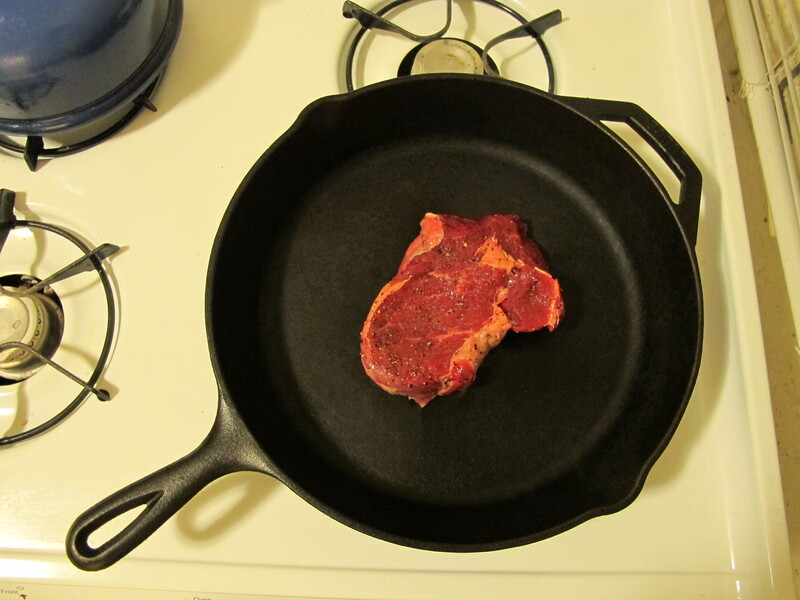 Immediately place the steak in the middle of the hot, dry skillet. Cook 30 seconds without moving. Turn with tongs and cook another 30 seconds, then put the pan straight into the oven for 2 minutes. Flip the steak and cook for another 1 1/2 to 2 minutes. If you like your steak cooked to medium, add a minute to both of the oven turns. Remove the steak from the skillet, cover loosely with foil and rest for 2 minutes. 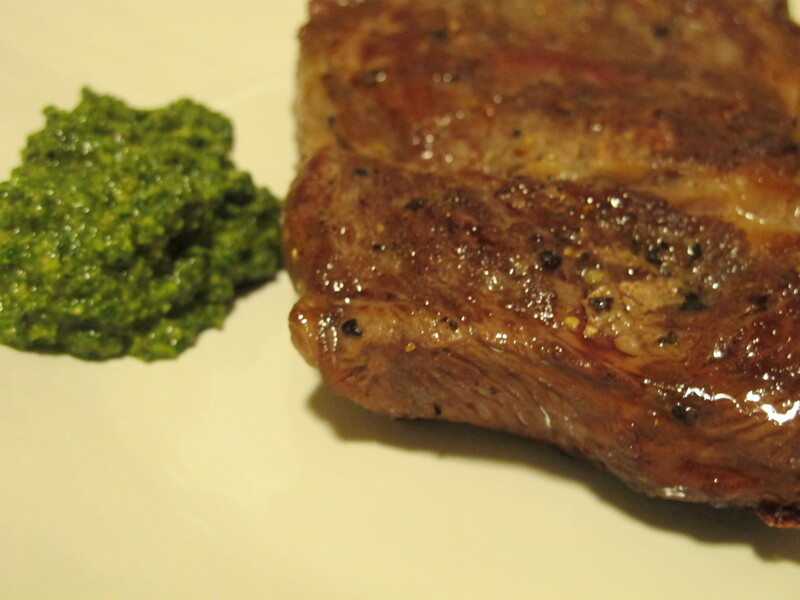 Serve solo or with your favorite accompaniments – pesto, chimichurri, Worcestershire – and a good glass of red wine.